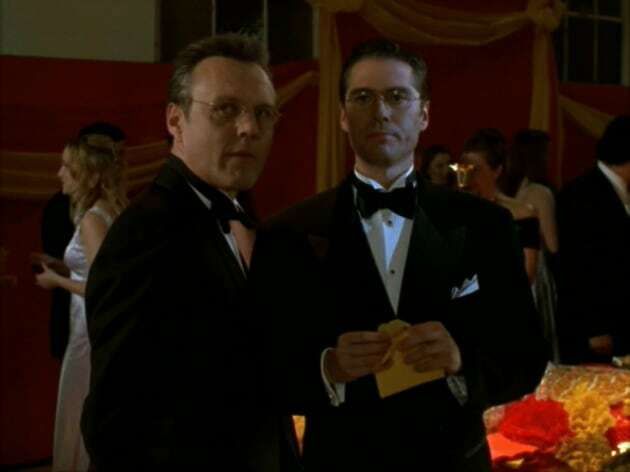 Buffy the Vampire Slayer Season 3 Episode 20: "The Prom"
Jonathan: This is actually a new category. First time ever. I guess there were a lot of write-in ballots, and, um, well, t-the prom committee asked me to read this. "We're not good friends. Most of us never found the time to get to know you, but that doesn't mean we haven't noticed you. We don't talk about it much, but it's no secret that Sunnydale High isn't really like other high schools. A lot of weird stuff happens here." Jonathan: "But whenever there was a problem or something creepy happened, you seemed to show up and stop it. Most of the people here have been saved by you or helped by you at one time or another. We're proud to say that the class of '99 has the lowest mortality rate of any graduating class in Sunnydale history, and we know at least part of that is because of you. So the senior class offers its thanks and gives you, uh, uh, this." Jonathan: It's from all of us, and it has written here, "Buffy Summers, Class Protector". Permalink: Buffy Summers, Class Protector. Buffy: That's it. Assuming we survive this Ascension thing, he's gonna leave town. Willow: Well, he's a fool. He's just a big, dumb, jerk person. If you ask me. And he's a super, maxi-jerk for doing it right before the prom. Buffy: That's not his fault. He's 243 years old. He doesn't exactly get the prom. Buffy: Wil, it's okay. You don't have to make him the bad guy. Willow: But, that's the best friend's job. Vilifying and grousing. Buffy: Usually, yeah. But he's right. I mean, I think, maybe in the long run, that he's right. Willow: Yeah. I think he is. I mean, I tried to hope for the best, but... I'm sorry. Must be horrible. Buffy: I think horrible is still coming. Right now, it's worse. Right now, I'm just trying to keep from dying. Buffy: I can't breathe, Wil. I feel like I can't breathe. Permalink: He's 243 years old. He doesn't exactly get the prom.